Rob Cesternino and Akiva Wienerkur wandered in circles, but they eventually found their way to their microphones to discuss the next episode from the third season in the Seinfeld series. 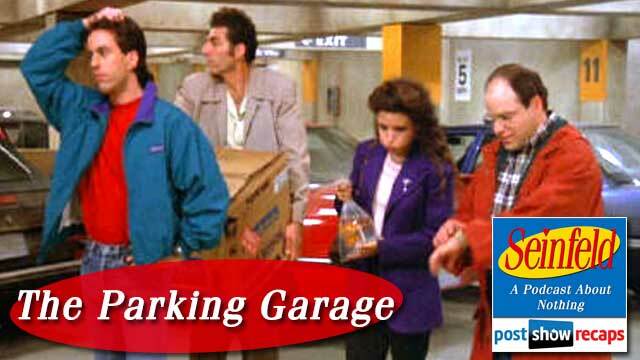 “The Parking Garage” first aired on October 30, 1991, and was another “bottle” episode, where all it’s scenes are shot entirely in one place. The guys felt that this is the type of episode they’ve been waiting for, having waded through enough muck from the first two seasons to make it all worth it. There was a bit of news from the Seinfeld universe this week. Jerry had an interview with Brian Williams where he discussed how he believes he is on the autistic spectrum. This piece didn’t necessarily cause a media controversy or backlash, but both Akiva and Rob felt it was an odd thing for Jerry to proclaim. The opening standup has Jerry talking about the mall, and how the maps are so difficult to follow. Rob thought that it was another bit that had very little to do with the episode plot, while Akiva thought that it was one of those bits that takes away from such a good story. Rob was quite intrigued with the production of this episode. He read that Larry David wrote the episode, and let the production team figure out how to make this expansive idea work. Akiva shared that it was production’s goal to rent out a parking garage, but ultimately they built a set to look like one. Since the set couldn’t be put in front of a live studio audience, the episode was shown after being edited to a live audience that came to see “The Voice”, an episode shot a few weeks later so there could be a laugh track. The episode opens with all four of them walking into the parking garage to find their car. As they enter the garage, we see Kramer is carrying a giant box with an air conditioner in it. Michael Richards famously insisted on carrying an actual air conditioner to make the physical comedy look more authentic. Elaine is carrying a goldfish, George is worried that he will be late for dinner with his parents and Jerry is concerned about finding a bathroom. With the weight of the box getting too much, Kramer decides to leave the air conditioner by a parking spot to pick up after they find the car. Jerry is needing to go to the bathroom so badly that Kramer urges him to just go in the garage. Meanwhile, George explains that the ramifications of not making it to dinner on time will be something his parents hold over his head the rest of his life. He jokes that he can just call them on their car phone and let them know he’s running late, which was an unheard of thing in 1991. Rob and Akiva discussed how the car phone was such a short lived gimmick, with the advancements in cell phones literally making the car phone obsolete. Still not finding the car, Jerry makes the assumption that the car must be on a different level. While continuing to wander for the car, a mother is dragging her son roughly to their car, and George decides to comment to the mother about being so rough. His good Samaritan nature that compelled him to speak up would be short lived as the son calls George ugly . Elaine is so desperate to get to the car to get her fish home that she decides she is going to ask other people to drive them around to look, but everyone she asks rebuffs her. As they keep looking, Jerry’s need to go to the bathroom continues, as does Kramer’s urging for him to relieve himself in the garage. He finally gives in, but when he turns around after finishing, there is a mall security guard waiting for him, and brings to custody. Jerry tries to say that he has a condition, and could die from uromysitisis poisoning if he holds it in. The scene cuts back to George, Elaine and Kramer, who now need to find Jerry. Elaine wants to go to another level to look for him, though George feels once they find Jerry, then never find her. George, getting fed up that everything keeps going wrong, says, what does it matter, we’ll all be dead one day anyway. Kramer finds peace in that thought, to which George scoffs that people like Kramer live to be 120 since they don’t care about anything. Akiva and Rob debated whether that statement could bring them peace of mind, or worry them further. Rob said he likes to think of it as positive, helping him to not worry so much about the little things like traffic. Kramer adds to his Zen-like thought by mentioning how the elderly often stave off death by living each moment to the fullest. While continuing to look for Jerry, George comments to Kramer how he likes his jacket. Rob really liked how Kramer explained that the jacket was left at his house by a friend of his mother, which would become a running story in future episodes. Back to Jerry at the security office, he is trying to tell the guard that he could have just been pouring something out, and not peeing. He finally admits he’s guilty, but uses George’s excuse that he has to hurry back to the city for an anniversary party. George and Kramer continue looking, and now George has to go to the bathroom. Kramer convinces him to just go, and George ends up getting caught by the same mall cop, who brings him back to the office as well. Rob and Akiva wondered how come George got to leave the mall cop office so quickly, while Jerry was detained for much longer. Jerry’s standup bit is about following someone and how it makes him nervous when they turn around and look at him. Rob felt this was a pretty weak bit. When it cuts back to the scene, Jerry and George are talking about General Chang from the Red Chinese prison. They finally run into Elaine, and explain how they were both arrested for urinating. As they are walking, they notice a Mercedes taking up two spots, which prompts George to want to spit on the car for the owner being so rude. As he goes to spit, the owner comes up, so George has to back off. As they continue walking, they encounter some tough Jersey Shore types. Elaine spouts off to them, but George and Jerry want no trouble. Next, they notice a red haired woman who agrees to help them find the car. As they are driving around, the woman inexplicably kicks them out, for apparently making a joke about L Ron Hubbard. It just so happened that the were kicked out right at the car, but there is no Kramer. Eventually, Kramer finds them again, as he had been wandering around looking for the air conditioner. Elaine has lost the fish, and they all are eager to get out of there, but when they go to leave, the car won’t start. Akiva learned that they originally planned the ending to be them driving around not be able to find an exit, but the car not starting was an unplanned success, so they went with that. Jerry’s final standup is about how the mall parking garage is such a hard place to navigate, and they should give the areas names you wouldn’t forget. “The Parking Garage” falls in at number 28 on Akiva’s list, which is the second best they’ve recapped so far. Rob disagreed, putting it atop the list of the episodes they’ve covered, feeling there is no clunky or boring parts. The guys had some things from the plot that would be negated in 2014. Rob said he often takes a picture with his phone of the sign near his car, while Akiva will type in the location on his notepad on his phone. Newman brought by a piece of mail for the guys to go over. Johnny De Silveira wondered why malls don’t put the map on the floor so people can navigate better. Akiva agreed, thinking there has to be a better way than currently constructed. He also wondered what was the longest time Rob or Akiva had to search for their cars in a parking garage. Rob usually thinks that the car has been stolen in this situation, adding that finding the car at a stadium can be equally as difficult. Listener Chester emailed Akiva directly to share how much he loved the episode, agreeing with Rob that it’s the best so far. Next week, Akiva and Rob will recap “The Café”, where we will first meet Babu Bhatt. Akiva pointed out that Babu is the first iconic recurring character. Don’t forget to subscribe to the podcast by going to postshowrecaps.com/seinfeldITunes, where you can’t rate and review the podcast. 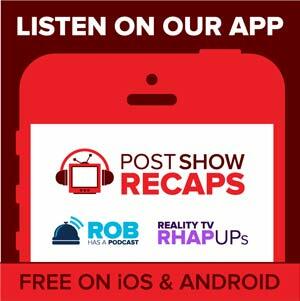 Let them know what you thought of the episode by leaving your comments on the page, and get your questions to the guys by emailing [email protected] You can also follow Rob and Akiva on twitter @robcesternino and @keev26.